Put my AP2 on the dyno today.. Here's one of the videos.. Here's the charts of the 3 pulls it made.. Very nice, flat, (and predictable) torque in the powerband! Thanks guys, I wasn't expecting it to put down as much torque as it did.. Must say I'm pretty impressed with it..
You Want Some Rep Points? you have reflash with it? No sir, still running on the stock ecu.. Thanks guys, the car runs great as is.. Planning on boosting it later on after I get an RSX to replace my Integra for a dd..
have you ever had a compression test done on the motor? Looks good - about on par with mine. I maxed at 215hp and 151ftlbs when I dyno'ed last year. Stock ECU as well. Hope to go FI early next year and re dyno. I would recommend a compression test and leakdown test once a year or so just to make sure the engine is healthy. Always a great piece of mind! Good to know, what are your mods sir? Last edited by Reckon; 06-13-2014 at 01:41 PM..
Yea I plan on boosting later on too, I'm thinking my tp not matching the exhaust might have held back a hp or 2.. But whatever.. 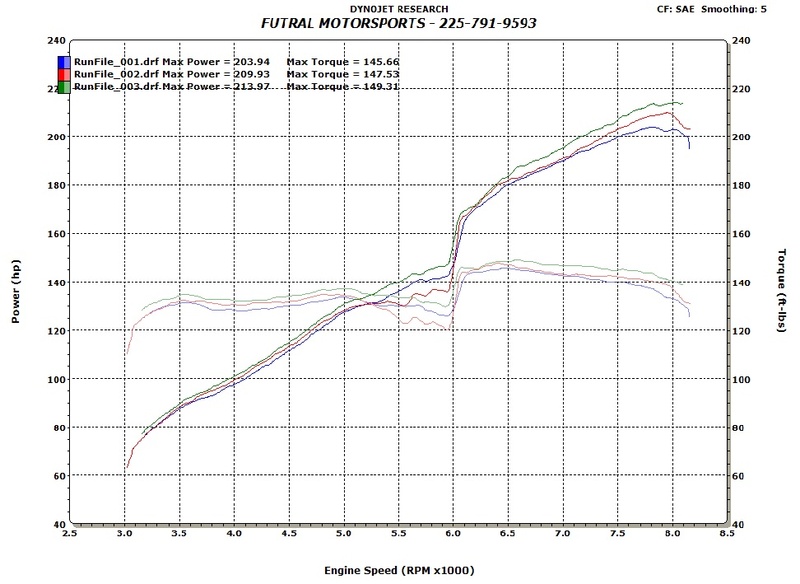 When I do get boost, I'm going stage 2 and getting the pulley to get at least 400whp.. I already have the mod list that I need to accompany the kit.. So it's on my list.. I have a CR lip at home waiting to be painted and be put on.. Here's my mod list.. Probably missing a few things but that's 90% of it..
Last edited by S2KiLLA; 06-13-2014 at 01:56 PM..
^Nice. I only need stage 1, just want a litte more straight line power. The car is more than capable on the twisties as is =D. I LOVE HIGH SCHOOL GIRLS! I would say you are in dire need of a flashpro...it will be one less piece you need for your future plans. notice the vtec dip gone and the beafy mid range. 203hp 152tq NA on stock internals. Last edited by Havana Joe; 11-03-2014 at 06:00 PM..
My car is an 05, not an option..